Take deep breaths. Try to notice your lungs filling entirely when inhaling, and completely emptying when you exhale - protrude your belly with each inhalation and hold it in with each exhalation if this helps. Yoga. Different practices of yoga teach various breathing exercises which many women find to be highly successful for alleviating anxiety and stress. Among the many benefits of exercise is the fact that it can trigger the release of endorphins in the brain. These are a chemical which is able to elevate mood - making it useful in the treatment of anxiety. As well as this aspect, many women find exercise to be valuable for relieving stress because it provides them with time to think and digest their thoughts. This is especially advantageous to those who have busy and hectic lives, and might not otherwise have time to themselves for this kind of contemplation. Anything that can help to occupy your mind should be considerably useful for easing periods of anxiety, because you will be forced to focus on another matter rather than the factor that has caused your distress. This technique has different results depending on the individual personality of the sufferer. Some women find that keeping a diary of their experiences can be beneficial for managing their anxiety. By noting down episodes of severe anxiety it can be possible to identify specific triggers, and therefore avoid or learn how to handle them in the future. Additionally, by writing down episodes when you successfully managed the problem, you can build confidence concerning your capability for addressing any further potential anxiety. 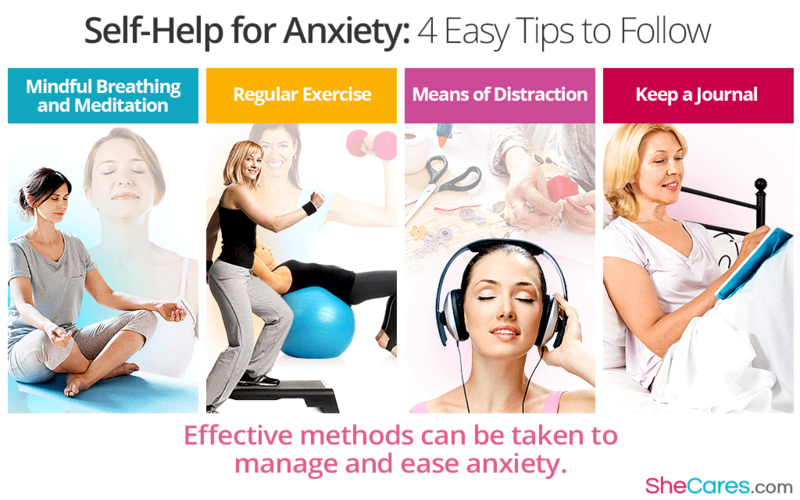 Any level of anxiety can have a negative impact on your life, and so it can be extremely beneficial to enhance your knowledge about how to face it should you need to. These are just some of the many self-help tips out there, and so with some dedication and will you should be able to find at least one method that is suitable for you.